The transporter: Tewari Brothers brings the flavour of Uttar Pradesh to Bangalore. Have you ever felt nostalgic for a place you haven’t even visited? Let me explain. Round the corner from my home in Bangalore is a small dhaba called Tewari Brothers. 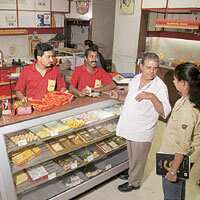 It is famous for its moti-choor laddus, but that is not why I frequent this place. I go there because, for me, visiting Tewari Brothers is like going to North India, particularly cities such as Varanasi or Lucknow, with their distinct cuisine and culture. The weird thing is that I haven't been to either place, even though I would love to. Hence my earlier question: Can you be nostalgic for a place you haven’t visited? For instance, I don’t know if Delhiites walk into Saravana Bhavan or Sagar to get a shot of South India, even if they haven’t been south of the Vindhyas. One of the reasons we love the restaurants we frequent is because they are transporting. Something about them, that has mostly to do with ambience, takes us to a different place. By ambience, I don’t just mean the décor, the costly baubles on the tables or the carefully thought out tapestries. Ambience is much more than that. It is the aromas floating around; the authenticity of the waitstaff, in terms of reflecting what the restaurant is about. I find that the restaurants that succeed most in doing this are the ones that don’t try so hard. Fine-dining restaurants such as the Spice Route and Olive may wow you with their self-conscious décor. But they aren’t transporting. They soothe, swaddle, make you feel rich and good about yourself. But it takes the nonchalance of a Swati Snacks or the unchoreographed disarray of a Chandni Chowk eatery to take you away. I didn’t plan on frequenting Tewari Brothers. It sort of grew on me, somewhat against my will. After all, eating puri-aloo four times a week is hardly healthy. But the food is only part of the experience. You enter the place and encounter a group of men all wearing red shirts and bright red tilaks on their foreheads. The aroma is redolent of chaat, hot puris, ghatte kisabzi and the ghee-sweets. And the music…oh, my God, the music. Always devotional, semi-mournful and certainly not catering to popular demand, which is probably why I admire the place. I mean, which dhaba in a hip urban city such as Bangalore will continue to play bhajans as background music? This is music that you can probably hear in the by-lanes of Varanasi or inner Uttar Pradesh. I certainly cannot decipher tunes or the singers, even though I listen to a fair bit of Hindustani music. I cannot predict when the impulse to go to Tewari’s will hit me. Usually it is when my husband is travelling and there is no interesting food at home. Chalo, I think to myself, why not duck into Tewari Brothers and grab a bite of lunch. “It will be quick and not interrupt the workday." Or so I rationalize. Sometimes it is at teatime, when the weather is damp and I want some monsoon snacks. “Let me just drop in and buy some samosas for the kids," I think. But it never really is for the kids; or anyone else. Tewari Brothers is something that I do solely for myself. I used to invite friends to meet me there for lunch, but the place is so unpretentious that I found myself constantly apologizing for having them traipse all the way from across town for a cheap plate of puri-aloo. And that’s the other thing. The price per plate is Rs25, with unlimited refills. I am told that the price is high by New Delhi standards, but for Bangalore, it is pretty reasonable. Often, I change into a salwar-kameez before I go. Somehow, I think it is disrespectful to the red-tilak-wearing waiters to show up in tight jeans and a T-shirt. So here is the routine. I drive my unwieldy Scorpio and double-park in front of the shop; propitiate the waving policeman with the universal Indian white flag. “Five minutes," I mouth as I rush in. The red-shirted waiters all gaze at me unimpressed by my hurried arrival. They’ve seen it all before. The cashier nods amiably as I hand over the money for my plate of puri-aloo. If I am feeling adventurous, I’ll have ghatte ki sabzi instead. Then I grab my plate and sit on the stainless steel counters. I usually bring a newspaper to read and eat my piping hot solitary lunch. There are many regulars, usually young and smart office-types from nearby Commercial Street. I gawk at them as they order specialities in shudh Marwari or Hindi. The occasional woman steps in to buy a box of sweets. In 10 minutes, I am done and ready for the worst part of the experience: the washbasin. In a cosmic joke that seems so natural in India, the shop next door houses Manoviraj Khosla, the flamboyant fashion designer who has about as much in common with bhajans as bhang has with a single malt. Tewari Brothers is my version of Cheers, the Boston bar made famous by the sitcom. Cheers was the place where “everyone knew your name", went the jingle. Well, nobody knows my name at Tewari Brothers. But they all “know" me, even if they don’t acknowledge it with an effusive “welcome back, Ma’am". Yet, there is that imperceptible nod with which they welcome me that makes me feel special. At Tewari Brothers, I can pretend. I can buy my kachori, close my eyes as I chew on it, and imagine that I am on the banks of the river Ganga or at a small dhaba in Lucknow.